Nursultan Äbishuly Nazarbayev[note 2] (born 6 July 1940) the Chairman of the Security Council of Kazakhstan who served as the first President of Kazakhstan, in office from 24 April 1990 until his resignation on 19 March 2019. He was named First Secretary of the Communist Party of the Kazakh SSR in 1989 and was elected as the nation's first president following its independence from the Soviet Union. He holds the title "Leader of the Nation". In April 2015, Nazarbayev was re-elected with almost 98% of the vote, as he ran "virtually unopposed". Nazarbayev has been accused of human rights abuses by several human rights organisations and according to The Guardian has suppressed dissent and presided over an authoritarian regime. No election held in Kazakhstan since independence has been judged to be free or fair by the West. In 2010, he announced reforms to encourage a multi-party system. In January 2017, Nazarbayev proposed constitutional reforms that would delegate powers to the Parliament of Kazakhstan. Nazarbayev was born in Chemolgan, a rural town near Almaty, when Kazakhstan was one of the republics of the Soviet Union. His father was a poor labourer who worked for a wealthy local family until Soviet rule confiscated the family's farmland in the 1930s during Joseph Stalin's collectivization policy. Following this, his father took the family to the mountains to live out a nomadic existence. His family's religious tradition was Sunni Islam. Nazarbayev's father, Abish, avoided compulsory military service due to a withered arm he had sustained when putting out a fire. At the end of World War II the family returned to the village of Chemolgan, and Nazarbayev began to learn the Russian language. He performed well at school, and was sent to a boarding school in Kaskelen. After leaving school, Nazarbayev took up a one-year, government-funded scholarship at the Karaganda Steel Mill in Temirtau. He also spent time training at a steel plant in Dniprodzerzhynsk, and therefore was away from Temirtau when riots broke out there over working conditions. By the age of twenty, he was earning a relatively good wage doing "incredibly heavy and dangerous work" in the blast furnace. Nazarbayev joined the Communist Party in 1962, becoming a prominent member of the Young Communist League and full-time worker for the party, and attended the Karagandy Polytechnic Institute. He was appointed secretary of the Communist Party Committee of the Karaganda Metallurgical Kombinat in 1972, and four years later became Second Secretary of the Karaganda Regional Party Committee. In his role as a bureaucrat, Nazarbayev dealt with legal papers, logistical problems, and industrial disputes, as well as meeting workers to solve individual issues. He later wrote that "the central allocation of capital investment and the distribution of funds" meant that infrastructure was poor, workers were demoralised and overworked, and centrally set targets were unrealistic; he saw the steel plant's problems as a microcosm for the problems for the Soviet Union as a whole. Nazarbayev (second from left) at the signing of the Alma-Ata Protocol, December 1991. In 1984, Nazarbayev became the Prime Minister of Kazakhstan (Chairman of the Council of Ministers), under Dinmukhamed Kunayev, the First Secretary of the Communist Party of Kazakhstan. At the sixteenth session of the Communist Party of Kazakhstan in January 1986, Nazarbayev criticized Askar Kunayev, head of the Academy of Sciences, for not reforming his department. Dinmukhamed Kunayev, Nazarbayev's boss and Askar's brother, felt deeply angered and betrayed. Kunayev went to Moscow and demanded Nazarbayev's dismissal while Nazarbayev's supporters campaigned for Kunayev's dismissal and Nazarbayev's promotion. Kunayev was ousted in 1986 and replaced by a Russian, Gennady Kolbin, who despite his office had little authority in Kazakhstan. Nazarbayev was named party leader on 22 June 1989, only the second Kazakh (after Kunayev) to hold the post. He was Chairman of the Supreme Soviet (head of state) from 22 February to 24 April 1990. On 24 April 1990, Nazarbayev was named the first President of Kazakhstan by the Supreme Soviet. He supported Russian President Boris Yeltsin against the attempted coup in August 1991 by Soviet hardliners. Nazarbayev was close enough to Soviet leader Mikhail Gorbachev for Gorbachev to consider him for the post of Vice President of the Soviet Union; however, Nazarbayev turned the offer down. The Soviet Union disintegrated following the failed coup, though Nazarbayev was highly concerned with maintaining the close economic ties between Kazakhstan and Russia. In the country's first presidential election, held on 1 December, he appeared alone on the ballot and won 91.5% of the vote. On 21 December, he signed the Alma-Ata Protocol, taking Kazakhstan into the Commonwealth of Independent States. Goh Chok Tong with Nazarbayev at the Akorda Palace. Nazarbayev with Vladimir Putin and Shavkat Mirziyoyev. Nazarbayev renamed the former State Defense Committees as the Ministry of Defense and appointed Sagadat Nurmagambetov as Defense Minister on 7 May 1992. The Supreme Council, under the leadership of Speaker Serikbolsyn Abdilin, began debating over a draft constitution in June 1992. The constitution created a strong executive branch with limited checks on executive power. Opposition political parties Azat, Zheltoqsan and the Republican Party, held demonstrations in Almaty from 10–17 June calling for the formation of a coalition government and the resignation of the government of Prime Minister Sergey Tereshchenko and the Supreme Council. The Parliament of Kazakhstan, composed of Communist Party legislators who had yet to stand in an election since the country gained independence, adopted the constitution on 28 January 1993. An April 1995 referendum extended Nazarbayev's term until 2000. He was re-elected in January 1999 and again in December 2005. The Organization for Security and Cooperation in Europe criticised the last presidential election as falling short of international democratic standards. On 18 May 2007, the Parliament of Kazakhstan approved a constitutional amendment which allowed the incumbent president—himself—to run for an unlimited number of five-year terms. This amendment applied specifically and only to Nazarbayev: the original constitution's prescribed maximum of two five-year terms will still apply to all future presidents of Kazakhstan. Nazarbayev appointed Altynbek Sarsenbayev, who at the time served as the Minister of Culture, Information and Concord, the Secretary of the Kazakh Security Council, replacing Marat Tazhin, on 4 May 2001. Tazhin became the Chairman of the National Security Committee, replacing Alnur Musayev. Musayev became the head of the Presidential Security Service. Notwithstanding Kazakhstan's membership in the Organisation of the Islamic Conference (now the Organisation of Islamic Cooperation), under Nazarbayev the country has had good relations with Israel. Diplomatic relations were established in 1992, and President Nazarbayev paid official visits to Israel in 1995 and 2000. Bilateral trade between the two countries amounted to US$724,000,000 in 2005. In 1994, Nazarbayev suggested relocating the capital city from Almaty to Astana, and the official changeover of the capital happened on 10 December 1997. On 4 December 2005, new presidential elections were held and President Nazarbayev won by an overwhelming majority of 91.15% (from a total of 6,871,571 eligible participating voters). Nazarbayev was sworn in for another seven-year term on 11 January 2006. In 2009, former UK Cabinet Minister Jonathan Aitken released a biography of the Kazakh leader entitled Nazarbayev and the Making of Kazakhstan. The book takes a generally pro-Nazarbayev stance, asserting in the introduction that he is mostly responsible for the success of modern Kazakhstan. Nazarbayev has always emphasised the role of education in the nation's social development. In order to make education affordable, on 13 January 2009, he introduced educational grant "Orken" for the talented youth of Kazakhstan. This decree was amended on 23 September 2016. In December 2011, opponents of Nazarbayev rioted in Mangystau, described by the BBC as the biggest opposition movement of his time in power. On 16 December 2011, demonstrations in the oil town of Zhanaozen clashed with police on the country's Independence Day. Fifteen people were shot dead by security forces and almost 100 people were injured. Protests quickly spread to other cities but then died down. The subsequent trial of demonstrators uncovered mass abuse and torture of detainees. "[President] Nazarbayev has led Kazakhstan through difficult times and into an era of prosperity and growth. He has demonstrated that he values his U.S. and Western alliances and is committed to achieving democratic governance." In December 2012, Nazarbayev outlined a forward-looking national strategy called the Kazakhstan 2050 Strategy. Nazarbayev with Lee Myung-bak in Seoul, 2010. Over the course of Nazarbayev's presidency, an increasing number of accusations of corruption and favoritism have been directed against Nazarbayev and his circle. Critics say that the country's government has come to resemble a clan system. According to The New Yorker, in 1999 Swiss banking officials discovered $8,500,000,000 in an account apparently belonging to Nazarbayev; the money, intended for the Kazakh treasury, had in part been transferred through accounts linked to James Giffen. Subsequently, Nazarbayev successfully pushed for a parliamentary bill granting him legal immunity, as well as another designed to legalise money laundering, angering critics further. When Kazakh opposition newspaper Respublika reported in 2002 that Nazarbayev had in the mid-1990s secretly stashed away $1,000,000,000 of state oil revenue in Swiss bank accounts, the decapitated carcass of a dog was left outside the newspaper's offices, with a warning reading "There won't be a next time"; the dog's head later turned up outside editor Irina Petrushova's apartment, with a warning reading "There will be no last time." The newspaper was firebombed as well. Nazarbayev with ex-President of Russia Dmitry Medvedev, President of Finland Tarja Halonen and Prime Minister of Spain José Luis Rodríguez Zapatero in 2011. As of 2015[update], Kazakhstan has never held an election meeting international standards. In May 2018, the Parliament of Kazakhstan passed a constitutional amendment allowing Nazarbayev to serve as Chairman of the Security Council for life. These reforms, which were approved by the Constitutional Council on 28 June, also expanded the powers of the Security Council, granting it the status of a constitutional body. The amendment states that, "The decisions of the security council and the chairman of the security council are mandatory and are subject to strict execution by state bodies, organisations and officials of the Republic of Kazakhstan." 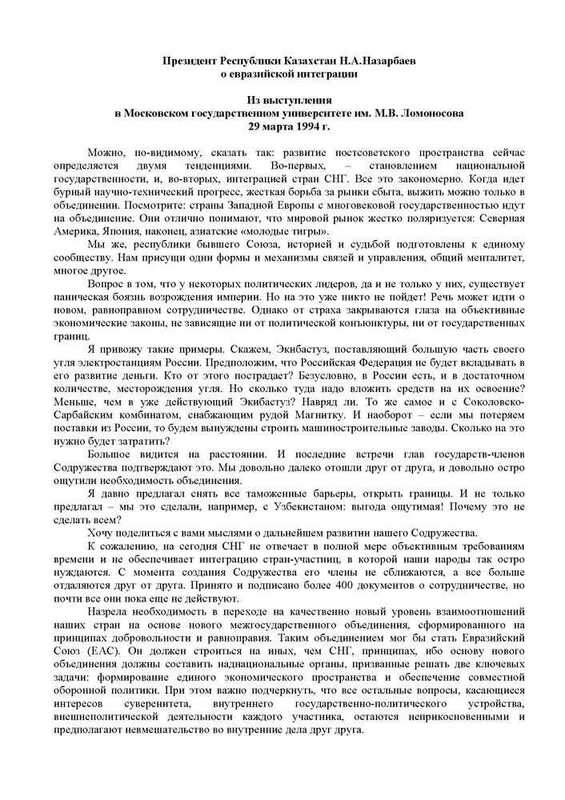 In 1994, Nazarbayev suggested the idea of creating a "Eurasian Union" during a speech at Moscow State University. On 29 May 2014, Russia, Belarus, and Kazakhstan signed a treaty to create a Eurasian Economic Union which created a single economic space of 170,000,000 people and came into effect in January 2015. Nazarbayev said shortly after the treaty was signed, "We see this as an open space and a new bridge between the growing economies of Europe and Asia." Nazarbayev unveiled in his 2012 State of the Nation the Kazakhstan 2050 Strategy, a long-term strategy to ensure future growth prospects of Kazakhstan, and position Kazakhstan as one of the 30 most developed nations in the world. President Nazarbayev unveiled in 2014 a multibillion-dollar domestic modernisation and reformation plan called Nurly Zhol - The Path to the Future. President Nazarbayev unveiled this technological modernization initiative to increase Kazakhstan's economic competitiveness through the digital ecosystem development. In his 1998 autobiography, Nazarbayev wrote that "The shrinking of the Aral Sea, because of its scope, is one of the most serious ecological disasters being faced by our planet today. It is not an exaggeration to put it on the same level as the destruction of the Amazon rainforest." He called on Uzbekistan, Turkmenistan, Tajikistan, Kyrgyzstan, and the wider world to do more to reverse the environmental damage done during the Soviet era. Kazakhstan inherited from the Soviet Union the world's fourth-largest stockpile of nuclear weapons. Within four years of independence, Kazakhstan possessed zero nuclear weapons. In one of the new government's first major decisions, Nazarbayev closed the Soviet nuclear test site at Semipalatinsk (Semei), where 456 nuclear tests had been conducted by the Soviet military. Presidents Nazarbayev & Obama held a bilateral meeting on the sidelines of the 2014 Nuclear Security Summit in The Hague. During the Soviet era, over 500 military experiments with nuclear weapons were conducted by scientists in the Kazakhstan region, mostly at the Semipalatinsk Test Site, causing radiation sickness and birth defects. As the influence of the Soviet Union waned, Nazarbayev closed the site. He later claimed that he had encouraged Olzhas Suleimenov's anti-nuclear movement in Kazakhstan, and was always fully committed to the group's goals. In what was dubbed "Project Sapphire", the Kazakhstan and United States governments worked closely together to dismantle former Soviet weapons stored in the country, with the Americans agreeing to fund over $800,000,000 in transportation and "compensation" costs. Nazarbayev encouraged the United Nations General Assembly to establish 29 August as the International Day Against Nuclear Tests. In his article he has proposed a new Non-Proliferation Treaty "that would guarantee clear obligations on the part of signatory governments and define real sanctions for those who fail to observe the terms of the agreement." His foreign minister signed a treaty authorising the Central Asian Nuclear Weapon Free Zone on 8 September 2006. In an oped in The Washington Times, Nazarbayev called for the Nuclear Non-proliferation Treaty to be modernised and better balanced. In March 2016, Nazarbayev released his "Manifesto: The World. The 21st century." In this manifest the Kazakhstan President called for expanding and replicating existing nuclear-weapon-free zones and stressed the need to modernise existing international disarmament treaties. In a speech given in December 2006 marking the fifteenth anniversary of Kazakhstan's independence, Nazarbayev stated he wished to join with Iran in support of a single currency for all Central Asian states and intended to push the idea forward with the President of Iran, Mahmoud Ahmadinejad, on an upcoming visit. The Kazakh president also reportedly criticised Iran as a terrorism-supporting state. The Kazakh Foreign Ministry released a statement on 19 December, saying the reports were mistaken and contradictory to what the president actually meant. During a visit to the central mosque of the Aktobe Region. Nazarbayev put forward the initiative of holding a forum of world and traditional religions in Astana. Earlier the organisers of similar events were only representatives of leading religions and denominations. Among other similar events aimed at establishing interdenominational dialogue were the meetings of representatives of world religions and denominations held in Assisi, Italy, in October 1986 and January 2002. The first Congress of World and Traditional Religions which gathered in 2003 allowed the leaders of all major religions to develop prospects for mutual cooperation. Nazarbayev initially espoused anti-religious views during the Soviet era; he later made efforts to highlight his Muslim heritage by performing the Hajj pilgrimage, and supporting mosque renovations. Under the leadership of Nazarbayev, the Republic of Kazakhstan enacted some degrees of multiculturalism in order to retain and attract talents from diverse ethnic groups among its citizenry, and even from nations that are developing ties of cooperation with the country, in order to coordinate human resources onto the state-guided path of global market economic participation. This principle of the Kazakh leadership has earned it the name "Singapore of the Steppes". However, in 2012 Nazarbayev proposed reforms, which were later enacted by the parliament, imposing stringent restrictions on religious practices. Religious groups were required to re-register, or face closure. The initiative was explained as an attempt to combat extremism. However, under the new law[which?] many[quantify] minority religious groups[which?] are deemed[by whom?] illegal[how?]. In order to exist on a local level, a group must have more than 50 members: more than 500 on a regional level, and more than 5,000 on the national level. Nazarbayev made critical remarks on the veil, highlighting the country's culture by stating that "We are Turks, not Arabs" in an open reference to the Turkic heritage. In 2014, Vladimir Putin's remarks regarding the historicity of Kazakhstan, in which he stated that Nazarbayev "created a state on a territory that never had a state ... Kazakhs never had any statehood, he has created it" led to a severe response from Nazarbayev. In February 2018, Reuters reported that "Kazakhstan further loosened cultural ties with its former political masters in Moscow ... when a ban on speaking Russian in cabinet meetings took effect ... [Nazarbayev] has also ordered all parliamentary hearings to be held in Kazakh, saying those who are not fluent must be provided with simultaneous translations." Kazakhstan's human rights situation under Nazarbayev is uniformly described as poor by independent observers. Human Rights Watch says that "Kazakhstan heavily restricts freedom of assembly, speech, and religion. In 2014, authorities closed newspapers, jailed or fined dozens of people after peaceful but unsanctioned protests, and fined or detained worshippers for practicing religion outside state controls. Government critics, including opposition leader Vladimir Kozlov, remained in detention after unfair trials. In mid-2014, Kazakhstan adopted new criminal, criminal executive, criminal procedural, and administrative codes, and a new law on trade unions, which contain articles restricting fundamental freedoms and are incompatible with international standards. Torture remains common in places of detention." Kazakhstan is ranked 161 out of 180 countries on the World Press Freedom Index, compiled by Reporters Without Borders. The law does not adequately provide for an independent judiciary. The executive branch sharply limited judicial independence. Prosecutors enjoyed a quasi-judicial role and had the authority to suspend court decisions. Corruption was evident at every stage of the judicial process. Although judges were among the most highly paid government employees, lawyers and human rights monitors alleged that judges, prosecutors, and other officials solicited bribes in exchange for favorable rulings in the majority of criminal cases. The National plan "100 concrete steps" introduced by President Nazarbayev included measures to reform the court system of Kazakhstan. The implementation of the national plan resulted in Kazakhstan's transition from a five-tier judicial system to a three-tier one in early 2016. During Nazarbayev's presidency the main principle of Kazakhstan's international relations was multi-vector foreign policy, which was based on initiatives to establish friendly relations with foreign partners. (then) U.S. President-elect Donald Trump lauded Nazabayev's leadership and called Kazakhstan's achievements under his presidency a "miracle" during their phone call on 30 November 2016. Israeli Prime Minister Benjamin Netanyahu conducted his first ever visit to Kazakhstan in mid-December 2016, when he met with Nazarbayev. The two countries signed agreements on research and development, aviation, civil service commissions and agricultural cooperation, as well as a declaration on establishing an agricultural consortium. In January 2019, Zimbabwean President Emmerson Mnangagwa conducted a state visit to Astana to meet with Nazarbayev, in the first visit by an African leader to the country in years. This would be the last foreign head of state that Nazarbayev would receive while in office. Nazarbayev's last state visit to a foreign country took place five days prior to his resignation, with his visit to the United Arab Emirates to meet Crown Prince Mohammed bin Zayed. On 19 March 2019, following unusually persistent protests in cities across the country, Nazarbayev announced his resignation as President of Kazakhstan, citing the need for "a new generation of leaders". The announcement was broadcast in a televised address in Astana after which he signed a decree ending his powers from 20 March 2019. Kassym-Jomart Tokayev, speaker of the upper house of parliament, was appointed as president of the country until the end of the presidential term. His resignation as President notwithstanding, he continues to head the ruling Nur Otan Party, remains a member of the Constitutional Council, and keeps his lifetime post as chairman of the Security Council. In his televised address Nazarbayev pointed out that he had been granted the honorary status of elbasy (leader of the nation, leader of the people[note 3]), the title bestowed upon him by parliament in 2010. He is still seen as the power behind the throne of the country. Various colleagues of Nazarbayev reacted within hours of the announcement, with Uzbek President Shavkat Mirziyoyev holding a telephone conversation with Nazarbayev, calling him a "great politician". In a cabinet meeting, Russian President Vladimir Putin praised Nazarbayev's leadership, even going as far to say that the Eurasian Economic Union was Nazarbayev's "brainchild". Other world leaders who sent messages to Nazarbayev included Ilham Aliyev, President of Azerbaijan, Alexander Lukashenko, President of Belarus, and Emomali Rahmon, President of Tajikistan. On 20 March 2019, after Nazarbayev's resignation, President Kassym-Jomart Tokayev proposed renaming the capital Astana to Nur-Sultan (Kazakh: Нұр-Сұлтан/Russian: Нур-Султан) in honor of Nazarbayev. The parliament of Kazakhstan officially voted in favour of the renaming. Nazarbayev is married to Sara Alpysqyzy Nazarbayeva. They have three daughters: Dariga, Dinara and Aliya. Having grown up in the USSR, Nazarbayev is fluent in Russian as well as Kazakh. He has two brothers, Satybaldy (1947–1980) and Bulat (born 1953), as well as one sister named Anip. ^ Kazakhstan declared independence from the Soviet Union on 16 December 1991. ^ In Kazakh, his name is spelled Нұрсұлтан Әбішұлы Назарбаев in Cyrillic; Nursultan Ábishuly Nazarbaev in Latin and pronounced [nʊrsʊlˈtɑn æbəɕʊˈlə nɑzɑɾˈbɑjɪf]. In Russian, his name is Нурсултан Абишевич Назарбаев, Nursultan Abishevich Nazarbayev, pronounced [nʊrsʊɫˈtan ɐˈbʲiʂɨvʲɪtɕ nəzɐrˈbajɪf]. ^ Etymology of elbasy: in Turkic languages, 'el'/'il' means 'the people', 'nation', '(home)land', etc., and 'bas'/'bash' means 'head' (both literally and in the meaning of 'leader'). A similar historical title is Ilkhan. ^ Principles of International Politics – Bruce Bueno de Mesquita – Google Books. Google Books. 14 January 2013. Retrieved 21 August 2014. ^ "Background on Nursultan Nazarbayev". Carnegie Endowment for International Peace. Retrieved 27 March 2019. The republic's Supreme Soviet elected Nazarbayev president of the Kazakh SSR on April 24, 1990. ^ a b c d "Veteran Kazakh leader Nazarbayev resigns after three decades in power". Reuters. 19 March 2019. Retrieved 19 March 2019. ^ Walker, Shaun (24 April 2015). "Kazakhstan election avoids question of Nazarbayev successor". The Guardian. ISSN 0261-3077. Retrieved 8 September 2016. ^ "Kazakh leader gains crushing election victory". BBC News. 27 April 2015. ^ a b c d Pannier, Bruce (11 March 2015). "Kazakhstan's long term president to run in show election – again". The Guardian. Retrieved 13 March 2015. Nazarbayev has clamped down on dissent in Kazakhstan, and the country has never held an election judged to be free or fair by the West. ^ a b Chivers, C.J. (6 December 2005). "Kazakh President Re-elected; voting Flawed, Observers Say". The New York Times. Retrieved 2 April 2014. Kazakhstan has never held an election that was not rigged. ^ "Kazakh Leader Ready to Devolve Some Powers to Parliament, Cabinet". Voice of America. ^ a b Sally N. Cummings (2002). Power and change in Central Asia. Psychology Press. pp. 59–61. ISBN 978-0-415-25585-1. Retrieved 3 February 2011. ^ "Union of Soviet Socialist Republics - historical state, Eurasia". ^ James Minahan (1998). Miniature empires: a historical dictionary of the newly independent states. Greenwood Publishing Group. pp. 136–. ISBN 978-0-313-30610-5. Retrieved 3 February 2011. ^ a b Karen Dawisha; Bruce Parrott (1994). Russia and the new states of Eurasia: the politics of upheaval. Cambridge University Press. pp. 317–318. ISBN 978-0-521-45895-5. Retrieved 3 February 2011. ^ Holley, David (19 May 2007). "Kazakhstan lifts term limits on long-ruling leader". Los Angeles Times. ISSN 0458-3035. Retrieved 20 March 2019. ^ Robert D'A. Henderson (21 July 2003). Brassey's International Intelligence Yearbook: 2003 Edition. Brassey's. p. 272. ISBN 978-1-57488-550-7. Retrieved 3 February 2011. ^ "Content". Archived from the original on 6 October 2006. Retrieved 18 February 2007. CS1 maint: BOT: original-url status unknown (link). Retrieved 3 February 2011. ^ "Official site of the President of the Republic of Kazakhstan – Astana". Akorda.kz. Archived from the original on 17 March 2015. Retrieved 21 August 2014. ^ "January 11. Kazinform's timeline of major events". lenta.inform.kz (in Russian). Retrieved 22 March 2018. ^ Aitken, Jonathan (2009). Nazarbayev and the Making of Kazakhstan. London: Continuum. pp. 1–4. ISBN 978-1-4411-5381-4. ^ INFORM.KZ (23 September 2016). "Kazakh President amends decree on educational grant for talented youngsters". Kazinform. ^ a b "Abuse claims swamp Kazakh oil riot trial". BBC. 15 May 2012. Retrieved 16 May 2012. ^ "Kazakhstan: Zhanaozen Oil Workers Did Not Take Up Arms". KazWorld.info. 15 December 2016. Retrieved 15 December 2016. ^ Flows, Capital. "The Stable State Of Nursultan Nazarbayev's Kazakhstan". Forbes. Retrieved 31 October 2017. ^ Witt, Daniel (11 June 2011). "Kazakhstan's Presidential Election Shows Progress". HuffPost. ^ Keene, Eli (21 February 2013). "Kazakhstan 2050 Strategy Leads to Government Restructuring". Carnegie Endowment for International Peace. Retrieved 31 October 2017. ^ "Kazakhstan: President suggests renaming the country". BBC. 7 February 2014. Retrieved 21 August 2014. ^ Martha Brill Olcott (1 September 2010). Kazakhstan: Unfulfilled Promise. Carnegie Endowment. pp. 27–28. ISBN 978-0-87003-299-8. ^ a b Seymour M. Hersh (9 July 2001). "The Price of oil". The New Yorker. ^ Peter Baker (11 June 2002). "As Kazakh scandal unfolds, Soviet-style reprisals begin". Chicago Tribune. ^ Casey Michel (7 August 2015). "Kazakhstan Goes After Opposition Media in New York Federal Court". The Diplomat. ^ a b Danny O'Brien (4 August 2015). "How Kazakhstan is Trying to Use the US Courts to Censor the Net". Electronic Frontier Foundation. ^ Holley, David (19 May 2007). "Kazakhstan lifts term limits on long-ruling leader". Los Angeles Times. Retrieved 2 April 2014. ^ July 2018, Aigerim Seisembayeva in Nation on 13 (13 July 2018). "Kazakh President given right to head National Security Council for life". The Astana Times. Retrieved 2 April 2019. ^ "Президент Республики Казахстан Н. А. Назарбаев о евразийской интеграции. Из выступления в Московском государственном университете им. М. В. Ломоносова 29 марта 1994 г." ^ a b "Russia, Belarus, Kazakhstan sign 'epoch' Eurasian Economic Union". RT. ^ "Strategy 2050: Kazakhstan's Road Map to Global Success". EdgeKZ. ^ "Kazakhstan's Nurly Zhol and China's Economic Belt of the Silk Road: Confluence of Goals". The Astana Times. ^ "Digital Kazakhstan initiative presented at Web Summit 2017". The Astana Times. ^ "NTI Kazakhstan Profile". Nuclear Threat Initiative (NTI). ^ "Kazakhstan and US Renew Nonproliferation Partnership". thediplomat.com. ^ "CENTRAL ASIA NUCLEAR-WEAPON-FREE-ZONE (CANWFZ)". Nuclear Threat Initiative. Retrieved 19 March 2019. ^ "Manifesto: The World. The 21st century". akorda.kz. ^ "Manifest by Kazakh President Calls for Global Nuclear Disarmament, Steps to End Global Conflicts". Astana Times. ^ "Kazakhstan dismisses alleged anti-Iran comments from president". Archived from the original on 8 March 2008. Retrieved 3 January 2007. CS1 maint: BOT: original-url status unknown (link). Retrieved 3 February 2011. ^ Congress of World Religions – About Congress of leaders of world and traditional religions. Religions-congress.org (15 October 2007). Retrieved 3 February 2011. ^ Preston, Peter (19 July 2009). "How Nursultan became the most loved man on Earth". The Guardian. ^ a b Leonard, Peter (29 September 2011). "Kazakhstan: Restrictive Religion Law Blow To Minority Groups". HuffPost. ^ "Kazakhstan: Religion Law Restricting Faith in the Name of Tackling Extremism?". EurasiaNet.org. 12 November 2012. Retrieved 21 August 2014. ^ "LiveLeak.com - We Are Turks, Not Arabs". ^ Diplomat, Casey Michel, The. "Putin's Chilling Kazakhstan Comments". ^ Traynor, Ian (1 September 2014). "Kazakhstan is latest Russian neighbour to feel Putin's chilly nationalist rhetoric". ^ "Kazakhs Worried After Putin Questions History of Country's Independence". ^ "Vladimir Putin Continues Soviet Rhetoric by Questioning Kazakhstan's 'Created' Independence". 1 September 2014. ^ "LiveLeak.com - Putin: 'Kazakhstan Was Never a State'". ^ Trilling, David (30 August 2014). "As Kazakhstan's Leader Asserts Independence, Did Putin Just Say, 'Not So Fast'?". EurasiaNet. ^ Brletich, Samantha. "The Crimea Model: Will Russia Annex the Northern Region of Kazakhstan?". ^ "Russian and Kazakh Leaders Exchange Worrying Statements". ^ "Nazarbayev's Severe Response to Putin". ^ Homepage TR (22 September 2015). "Nazarbayev vs Putin" – via YouTube. ^ "LiveLeak.com - Nazarbayev Gives Putin a History Lesson". ^ Lillis, Joanna (27 January 2016). "Kazakhstan creates its own Game of Thrones to defy Putin and Borat". ^ "New Kazakh TV series a riposte to Putin and Borat". ^ Lillis, Joanna (6 January 2015). "Kazakhstan Celebrates Statehood in Riposte to Russia". EurasiaNet. ^ "Kazakhstan MP responds to Vladimir Putin's statement on lack of statehood in Kazakhstan - Politics - Tengrinews". ^ Najibullah, Farangis (3 September 2014). "Putin Downplays Kazakh Independence, Sparks Angry Reaction" – via Radio Free Europe / Radio Liberty. ^ Michel, Casey (19 January 2015). "Even Vladimir Putin's Authoritarian Allies Are Fed Up With Russia's Crumbling Economy". ^ Human Rights Watch, World Report 2015: Kazakhstan. Retrieved October 2015. ^ "Rule of Law Index 2015". World Justice Project. ^ "Kazakh President instructs to improve court system". kazinform. ^ "Nazarbayev's trust-based relations with foreign partners help promote Kazakhstan's interests". inform.kz. ^ "Kazakhstan: Trump talked up leader's 'miracle' in call". The Hill. ^ "PM Netanyahu meets with Kazakhstan President Nursultan Nazarbayev". mfa.gov.il. ^ "Mnangagwa arrives in Kazakhstan". The Zimbabwe Mail. 19 January 2019. ^ a b "Kazakh President Nazarbaev Abruptly Resigns, But Will Retain Key Roles". RadioFreeEurope/RadioLiberty. ^ Обращение Главы государства Нурсултана Назарбаева к народу Казахстана. The official web site of the President of Kazakhstan, 19 March 2019. ^ "The people of Kazakhstan wonder who their next president will be". The Economist. 11 April 2019. ^ INFORM.KZ. "Shavkat Mirziyoyev: Nursultan Nazarbayev is a great politician". www.inform.kz. ^ Ruptly (20 March 2019). "Russia: Putin praises former Kazakh President Nursultan Nazarbayev" – via YouTube. ^ "Official web-site of President of Azerbaijan Republic - NEWS » Press service information". en.president.az. ^ "Нур-Султан - новое название столицы Казахстана". Tengrinews.kz. 20 March 2019. ^ Тұңғыш Президенттің балалық шағы. Books.google.com. 2011. Retrieved 26 March 2019. Wikimedia Commons has media related to Nursultan Nazarbayev.